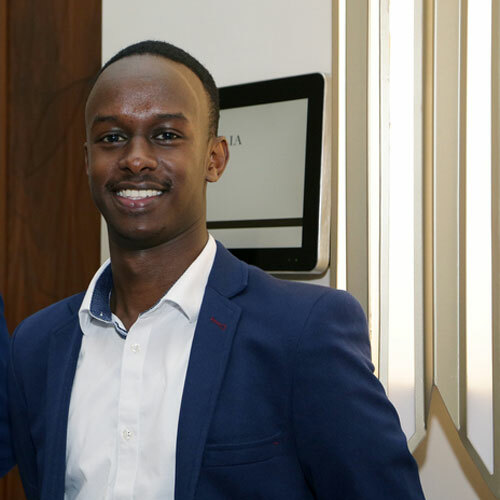 Class of 2016 graduate Brian Langat pursued a Bachelor of Business Science (BBS) degree in Financial Economics, and has made great strides in the United Arab Emirates in data analytics and reporting business finance matters. Brian, 24 years old, is the last born in a family of five children with 3 having studied at Strathmore before him. His father is also an alumnus of Strathmore, so the family takes pride in the institution. I am currently a Management Trainee and part of the award winning Global Leadership Development Program at Marriott International. Best known for its footprint in hospitality, Marriott International is currently the world’s largest multinational company in the industry with a portfolio of 6000+ hotels and resorts across the world. As a management trainee, I am posted in the Middle East & Africa headquarters in Dubai, UAE with a focus on Learning and Development Reporting and Analytics and Business Support Finance. The Middle East & Africa headquarters manages and franchises 350+ resorts and hotels, encompassing 19 distinct brands. My experience so far has been nothing short of extraordinary; no day at the Marriott is ever the same with new challenging opportunities, very supportive leaders and mentors, and the chance to build a career I envision. I have been involved in projects that directly affect business operations in which my input has contributed towards increasing global operations. Being here is an endless learning curve that enables me to nurture my interests in data-driven decisions and business finance. Why did you choose to study BBS…? I am a graduate of the Class of 2016, having pursued a Bachelor of Business Science degree in Financial Economics. I am naturally drawn towards quantitative based thinking and while in high school, I knew I wanted to pursue a degree that capitalized on my interest, and my mathematical abilities. Additionally, I chose the BBS program because of the strong reputation it had garnered, from enrolling top students from around the country to offering an intellectual challenge over the course of the program. The program did indeed live up to its reputation, I had very driven classmates who I studied with and most, if not all, of my friends now have thriving careers both in academia and in different industries. Did you take part in any extra-curricular activities while at School? 5 to 10 years is quite a long stretch full of uncertainty, but what I can hope for is that I will have sharpened my skills in data analytics and finance. The world is at a pivotal point where data-driven decisions are the hallmark of business decisions and I hope to gain the relevant skills to take advantage of opportunities to come, while staying true to my core interest, and building blocks in corporate finance. I also wish to gain an advanced degree in the aforementioned fields. The endless opportunities available for a willing mindset! I take pride in continuously re-inventing myself and my career and in taking new paths that have not been explored before; that is where all the magic happens and where new ideas are generated. Having taken up a very rigorous quantitative course in my undergraduate years and now working for the biggest hospitality conglomerate in the world, I have seen synergies and gained opportunities to apply my knowledge in one of the most innovative companies in the world. That is what makes me get up every morning, knowing that this is an adventure, full of high risks and high returns, a basic concept in economics 101.